In 2019 we celebrate the 250th birthday of the scientist Alexander von Humboldt, the true “discoverer” of America according to Simon Bolívar, who knew him personally. 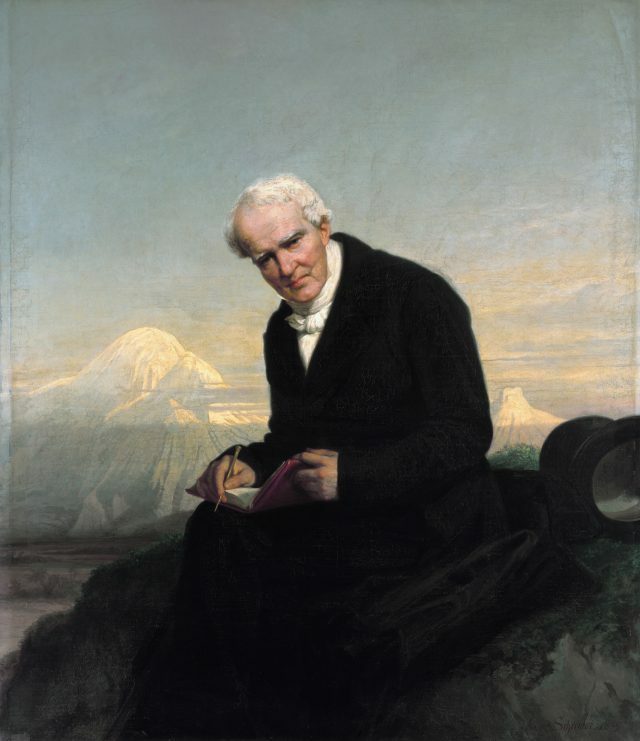 Between 1799 and 1804, Alexander von Humboldt, accompanied by the French botanist Aimé Bonpland, traveled through the colonies of Spanish America, exploring regions that today belong to Venezuela, Ecuador, Colombia, Peru and Cuba. Back in Europe, Humboldt began publishing several books recounting his adventures in America, revealing the natural and cultural riches of South America to a curious and fascinated European public. While writing about the wonders of the tropical nature of America and the cultural wealth of its original peoples, Humboldt denounced — like no other before him — the horrors of slavery, the oppression of Indigenous peoples, and the injustices of the colonial system. His importance for our time is due precisely to his ability to see the interrelations between the environment, society, politics and the economy. He was the first modern Western thinker to scientifically describe the planet as a living organism where humans, plants, animals, soils and climate interact and influence each other. The novelty of this vision at his time, when a mechanistic view of nature still prevailed, was revolutionary. For Humboldt, poetry and science were two complementary and necessary ways of understanding the world. His influence on poets, writers, and scientists was enormous. Goethe loved spending hours talking to his younger friend Humboldt. Both «Faust» and his studies of plants might not have existed as we know them today had it not been for Humboldt’s influence. Charles Darwin took several of Humboldt’s books with him on his Beagle voyage, with which he was in constant dialogue. Without Humboldt, Darwin would hardly have written the Origin of Species, or Thoreau would hardly have written Walden. Humboldt was probably the last scientist capable of understanding almost all scientific thinking of his day, and used this knowledge to show how different phenomena relate to each other in an approach that we would call today «interdisciplinary». Humboldt drew attention to the fact that forests increase the ability of soils to retain water and how they contribute to regulate climate. Understanding these interrelationships and how they contribute to climate change is a key part of the work of the Intergovernmental Panel on Climate Change (IPCC) — what Humboldt did more that 100 years ago. Moreover, Humboldt clearly denounced the colonial system and the capitalist mode of production — without using this term — as the main mode responsible for the destruction of the environment and consequent impacts on climate: European farmers and their production turned to the interests of the metropolis, using slave labor and expelling Indigenous peoples from their lands. Humboldt clearly denounced European colonial “barbarism” and presented a vision of South American Indigenous peoples and black slaves differently from the dominant assumptions of their time. Humboldt not only rejected the endemic racism and the supposed “superiority” of the “white race”, but declared that the cultures of Indigenous peoples are as creative and diverse as European cultures. In addition, Humboldt vehemently attacked Count Buffon, one of the leading proponents of European “scientific racism,” and exposed the ridicule of his ideas. The progress of science in the 19th century has inevitably led to even greater specialization and the relative isolation of various scientific disciplines, thus hindering non-integral view of the planet that Humboldt still could have. This situation is still prevalent today, since the greatest difficulty we have is integrating the enormous amount of knowledge that we accumulated in several fields into an overview — a fundamental task that could contribute immensely to our future. Once again, the work of the IPCC is a concrete and current example of this attempt. However, by its very nature, the IPCC cannot clearly and precisely include the political and economic dimensions in its studies — or even superficially allude to the problems posed by the capitalist economy, not to mention condemning capitalism itself. If, on one hand, Humboldt’s world-view, combining philosophy, poetry and natural sciences, was possible only at the time he lived; on the other hand, in a certain way, Humboldt came “too soon”. He died before Germany began its experiments with colonies in Africa, especially in Namibia, and the consequent upsurge of “scientific” racism in Germany and throughout Europe. The Count de Gobineau, who would retake the banner of Bouffon racism so ridiculed by Humboldt, was born in 1816 — Humboldt was then 47 – and lived until 1882, so over 20 years after Humboldt died, over 20 years of “work” spreading racist theories with no one with the same reputation and ability as Alexander von Humboldt to contradict him. The connection between German colonialism in Africa and the later emergence of the Nazi movement has been amply demonstrated by historians such as David Olusoga and Casper W. Erichsen in “The Kaiser’s Holocaust.” With the rise of Nazism in Germany in the late 1920s, how could the thinking of Humboldt, the most celebrated German scientist of the 19th century, be reconciled with the Nazi ideology? In fact, at the end of the 19th century, Humboldt had already become an embarrassing character for Europe’s cultural capitalist elite. Consequently, his work had to be purged of its most visionary part: its denunciation of colonialism, economic exploitation of the environment, and of human beings — especially Indigenous peoples and slaves. We had to forget that the most celebrated scientist of all time attacked racism and defended the Indigenous peoples and black slaves from capitalist economic exploitation, precisely so that the exploitation of third world countries by the same European powers denounced by Humboldt could continue. I may be mistaken, but I do not think that Karl Marx – an exact contemporary of the Count de Gobineau – studied the writings of Humboldt in depth. I believe that Marxism would have acquired another understanding of colonialism, racism and the supposed «superiority» of European civilization and the «white race» over indigenous and black peoples.The ideas of Hegel on all that – a contemporary of Humboldt who greatly influenced Marx – were much closer to the thinking of Count de Gobineau than to the revolutionary vision of Humboldt. Perhaps the most relevant contribution of Humboldt to the understanding of our own times comes from the relationship between him, Simon Bolivar, and Thomas Jefferson. On his return from the voyage through Spanish America in 1804, Humboldt spent a short time in the United States where he met Thomas Jefferson, the then celebrated President of the U.S.A. Jefferson shared the same interests in natural sciences as Humboldt, and also had an encyclopedic mind. The two got along very well, talking for hours when Humboldt was a guest at the White House. But there was an irreconcilable fundamental question between the two: slavery. Thomas Jefferson, one of the founding fathers of the new republic that claimed to be the homeland of liberty and equality was not only the owner of slaves, but also advocated the importance of maintaining slavery for the economic development of the United States. Humboldt denounced the horror and hypocrisy underlying such an idea of ”economic development”. Jefferson also agreed with Buffon’s ideas about the “inferiority” of the “black race”, which Humboldt considered idiotic. Shortly after his return to Paris, Humboldt was introduced to a young gentleman, newly arrived from the Spanish colonies of America: Simon Bolívar, the future “liberator”. Bolivar reported how the meeting with Humboldt opened his eyes to the wonders and potential of his own country: the future Venezuela. As Bolívar wrote in his famous «Letter of Jamaica», it was Humboldt who really showed him his own continent, America. The two met again some months later in Rome – and at this time Bolívar already spoke about the independence of Spanish America. At this moment the advice and wisdom of Humboldt were fundamental for the political maturity of young Bolívar. While in Rome, Bolivar would swear an oath to free America, and then return to his country. Bolívar’s fight for the independence of the Spanish colonies did not go unnoticed by Thomas Jefferson, who was in touch with Humboldt, requesting information about the revolutionary movement led by Bolivar as it unfolded — questions that Humboldt could answer “better than any other”, as Jefferson wrote. But Jefferson’s relationship with the struggle for liberation from the Spanish colonies was rather ambiguous. If on one hand, Jefferson considered important the establishment of republics and the end of control by the Spanish monarchy in the American territory, he also feared the consequences of this liberation on the U.S. economy. While Spain maintained its control over the colonies, the U.S. economy benefited from the export of grains and wheat to Spanish America, since the agriculture of the colonies was entirely geared to the financial interests of the metropolis or, as we would say today, was an economy based on the export of a few products to the world market. With independence, the colonies could produce their own food, which was a blow to U.S. exports. The independence of Spanish America posed another, much greater danger to the United States — a danger that Jefferson understood very well: he hoped the colonies would remain separate and not unite in one country, for as “a single mass they will be a very powerful neighbour”, Jefferson admitted. And since then this has been the great nightmare of the US: a united, independent and powerful South America. It is the main reason behind the United States’ aggression towards Venezuela today. Venezuela has oil and other natural resources coveted by the large multinational corporations intrinsically linked to the elite that governs the United States. But this fact does not fully explain the US’ intense aversion and hostility towards Venezuela. The deepest and oldest reason dates back to Humboldt’s time, to the liberation wars of Bolivar and the Jefferson administration: the necessity of preventing, by all means, the union of South America, of not allowing its development to be independent and sovereign. Since his election in 1999, Hugo Chavez suffered three violent attacks: the 2002 coup, the 2002-2003 “strike” and the 2004 “recall” referendum, not to mention the permanent attempts to destabilize and strangle Venezuelan economy. But Chávez also contributed most to Latin American integration: UNASUR and CELAC were initiatives led mainly by Venezuela under his government, the most dangerous challenge to U.S. hegemony in the region since the Cuban revolution. Hugo Chávez and Venezuela dared to revive Simon Bolvar’s dream of an independent, united, sovereign and powerful South America. The empire can not bear this affront — nor this threat. Simon Bolívar, unlike Jefferson, freed all his slaves and called for the abolition of slavery in his famous Angostura address in 1819, hence Humboldt’s admiration in the quotation at the beginning of this text [Note: the abolition of slavery in Venezuela only took place in 1854]. Humboldt accompanied and encouraged the struggles for Spanish America’s independence until the end of his life. Between Jefferson and Bolivar, between a nation that frees its slaves and another that feeds on them, Humboldt chose the side of Bolivar and his project. In the 20th century, Humboldt would have defended and supported the liberation movements of the European colonies in Africa and Asia, exchanged letters with Ho Chi Min and defended Vietnam; he would have welcomed the Cuban revolution and been friends with Fidel Castro and Che Guevara. Humboldt would have admired Hugo Chavez and the Bolivarian project, ALBA. There is no doubt that, today, Humboldt would be defending Venezuela against the aggressions of the “Republic of white men”. Gabriel Garcia Marquez knew this, that’s why Humboldt appears in his novel “The General in his Labyrinth” and is also mentioned in “One Hundred Years of Solitude”. Perhaps the planned events of the “Humboldt Year”, mainly by institutions in Germany, will not speak of this Humboldt. Perhaps they will describe him as a character of the past, with little relevance to the present or to the future, but then this could be considered the most glaring example of Europe’s betrayal of its own Enlightenment ideals today. When we see the elite of Europe joining the lies of the Empire about Venezuela, when we see Europe joining the coup against the legitimately elected government of Nicolas Maduro — it is clear that this aggression is not only against the Venezuelan people, but also against the best of European culture. Celebrating Humboldt today and at the same time not defending Venezuela will be yet another example of the hypocrisy and lack of intellectual honesty that seems to have become the hallmark of our time. It will perhaps be up to Venezuela, Cuba and Bolivia to move the celebrations of the “Humboldt Year” forward since Alexander von Humboldt and his legacy live much more among these Latin American peoples than in a neoliberal Europe increasingly submissive to the interests of the Empire and the “white supremacy” it represents.